Katarina "Tina" Lehn: long-time housemother at the Mädchenheim (Mary Martha Girls' Home); born 26 January 1907 in Kronsgarten, Chortitza Colony, South Russia, to Gerhard G. Lehn (27 March 1881 - 1 March 1970) and Sara (Ens) Lehn (17 February 1886 – 9 March 1933). Katarina was the oldest of five daughters. She never married, choosing instead to dedicate herself to a life of service. Tina died 15 January 2003 in Chilliwack, British Columbia. Katarina finished her secondary education in the Ukraine, cultivating a love of learning which inspired her to remain a life-long avid reader. She immigrated to Canada with her parents and siblings in 1926. The family first settled in the Hanley District of Saskatchewan where Katarina was baptized at the Sheldon Mennonite Church by Bishop J. J. Klassen. Soon after her arrival in Saskatchewan she began working as a domestic maid to support her pioneering family. Before long she moved to Saskatoon about 30 miles away to do similar work in order to finance a younger sister's high school and Normal School studies. It was here that Katarina also first experienced the help and companionship of a Mennonite Girls' home, and met J. J. and Katherine Thiessen, who were the house parents. 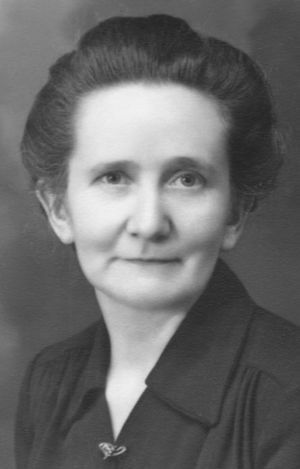 When Katarina moved to Vancouver in 1938, she at once began to associate with the Mädchenheim (Mary Martha Girls' Home) situated at St. George and 49th in Vancouver. The Home at that time was managed by Jacob B. and Erna Wiens. While working in Vancouver, Katarina came to be a regular visitor at the home on Thursdays and Sundays. By 1946 Jacob and Erna Wiens were no longer able to manage the home owing to their own growing family, so Katarina was asked to become the new director. She commenced her duties on 31 August 1946. Within two years her services as a compassionate housemother became much in demand, for by 1948 young Mennonite women were immigrating to Canada in large numbers as war refugees. For those who found their way to the Vancouver Girls' Home, Katarina became a friend, mentor, language instructor and job counselor, as the Girls' Home became their refuge on days away from work. At times the Home would be filled with up to twenty Mennonite girls, many of them newcomers trying to make sense of unfamiliar Canadian ways. Katarina would listen with empathy to their stories of grief and loneliness. She forged many bonds of friendship, especially over the delicious meals that she prepared with tireless energy. The Home provided spiritual direction to the war-weary refugees through weekly Bible study led by Jacob Wiens. The Home also recognized the women's love for singing, and had its own choir which served local churches as opportunities permitted. Since Katarina herself had also mastered the fine art of sewing, a skill she generously used in support of her own sisters, the Home offered opportunities for sewing. The resulting handiwork was then sold at the annual auction sales in support of mission work. On 31 August 1957 Katarina terminated her work at the Girls' Home in order to serve her own aging parents. For Katarina Lehn the ten years managing the Vancouver Girls' Home were, in her own words, "the best years of my life." Der Bote (2 April 2003): 23 (Obituary). Lehn, Cornelia and Richard D. Thiessen. "Lehn, Katarina (1907-2003)." Global Anabaptist Mennonite Encyclopedia Online. October 2005. Web. 23 Apr 2019. http://gameo.org/index.php?title=Lehn,_Katarina_(1907-2003)&oldid=136153. Lehn, Cornelia and Richard D. Thiessen. (October 2005). Lehn, Katarina (1907-2003). Global Anabaptist Mennonite Encyclopedia Online. Retrieved 23 April 2019, from http://gameo.org/index.php?title=Lehn,_Katarina_(1907-2003)&oldid=136153. This page was last modified on 4 October 2016, at 21:54.